Cycling England is an independent, expert body, working to get more people cycling, more safely, more often. Established in 2005 by the Department for Transport, we promote the growth of cycling in England by championing best practice and channeling funding to partners engaged in training, engineering and marketing projects. With the Department for Transport’s continued support and funding we work tirelessly to make the case for cycling, showing how the humble bicycle can transform the way we travel to create a greener, healthier nation. Cycling England replaced the National Cycling Strategy Board and was established in 2005 by the Department for Transport. Backed by key Government departments and cycling organisations, our original remit revolved around two key projects creating a cycling proficiency scheme for the 21st century, and trialling the impact of European levels of funding in six English towns and cities. We launched Bikeability in March 2007, which offers children and adults professional, on-road training to help them develop the skills to navigate through today’s modern traffic conditions. Half of all the local authorities in England have already registered to deliver the scheme, giving families and individuals the confidence to get back in the saddle. We have also worked alongside our first six ‘Cycling Towns’, Aylesbury, Brighton, Darlington, Derby, Exeter and Lancaster with Morecambe, to help them implement programmes to accelerate local take-up of cycling. In 2007 we worked with economists SQW to produce the first economic analysis of the benefits of cycling to the UK economy. We also proposed our plans for the future of cycling in England with ‘Bike for the Future II’. Both of these documents enabled us to secure the additional funding necessary for Cycling England to continue its mission to get more people cycling, more safely, more often. 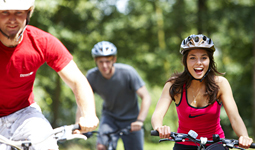 Allow 500,000 more 10 year olds to take part in Bikeability cycle training by 2012. Build an additional 250 Safe Links to Schools, connecting around 500 more schools to the National Cycle Network. Support Bristol, Englands first Cycling City and our eleven new Cycling Towns as well as continuing to work with our six original areas. We thank our partners for their continued support, and look forward to the journey ahead. Our board is made up of experts from the related fields of public health, town planning, sustainable transport and the environment, as well as leading cycling campaigners and industry representatives. Action notes from Cycling England Board meetings can be found in our Board Action Notes section. Cycling England is supported and funded by the Department for Transport. Cycling England also works with a range of partners who all share a vision of more people cycling, more safely, more often. To visit our partners’ websites, please click on the relevant logos below.